This candy apple dump cake is perfect for last-minute desserts that bake while you’re eating dinner or for potlucks with friends and family. One of my favorite fall pastimes to do before Halloween is apple picking with the family. Something about the cool crisp air, the delicious juicy apples right off the tree, and the smiles on my kids faces when they pick that first apple off. But it doesn’t end at the orchard! Then you get to go home and bake yummy goodies with all the apples you managed not to eat on the drive back home. When deciding what to bake with the apples we picked in Boston on our trip back a few years ago I knew I wanted to incorporate Halloween and the fun of the season. 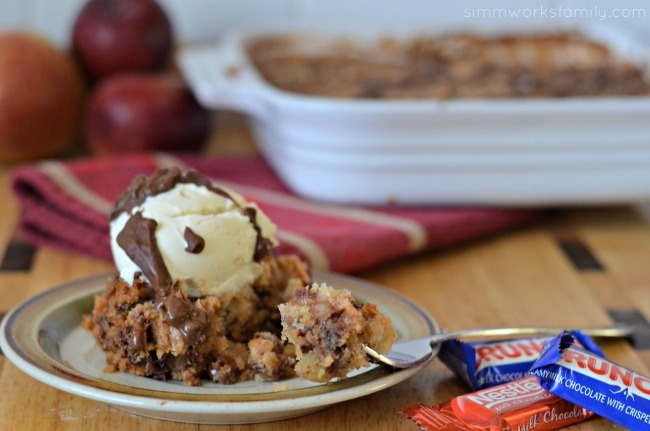 Since I had just recently stopped by Smart and Final for our Halloween candy stash I decided to incorporate the delicious Nestle goodies I picked up in this Candy Apple Dump Cake. Once I got home it was time to start baking. 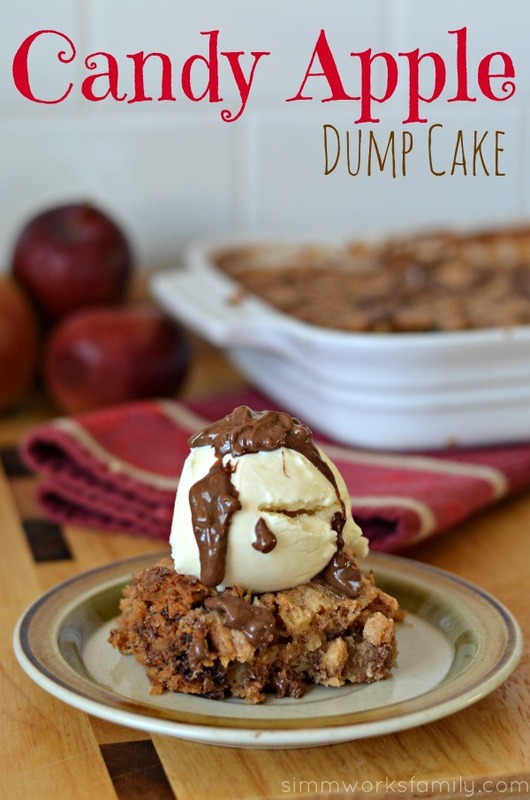 Now, this candy apple dump cake is literally what the name alludes to. 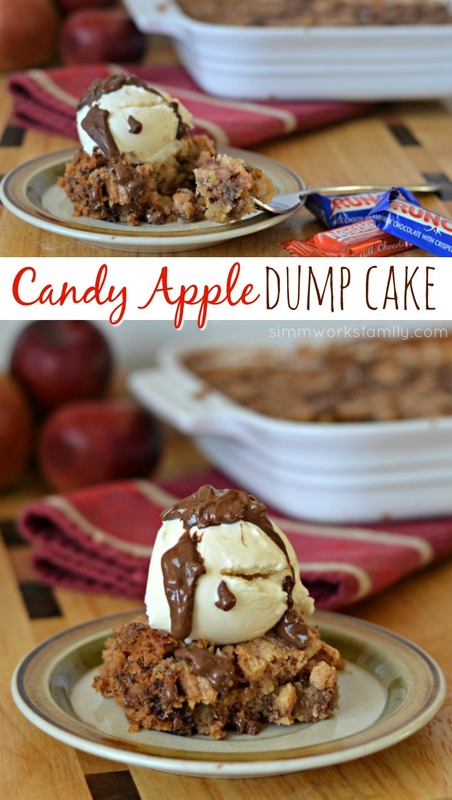 Chopped up candy, apples, cake, and butter all dumped into the pan, stirred up, and baked! So simple yet so delicious. Since I purchased a few extra bags of candy to bake with I decided to chop up my favorite Nestle crunch bars and Nestle chocolate bars to add to the mix. 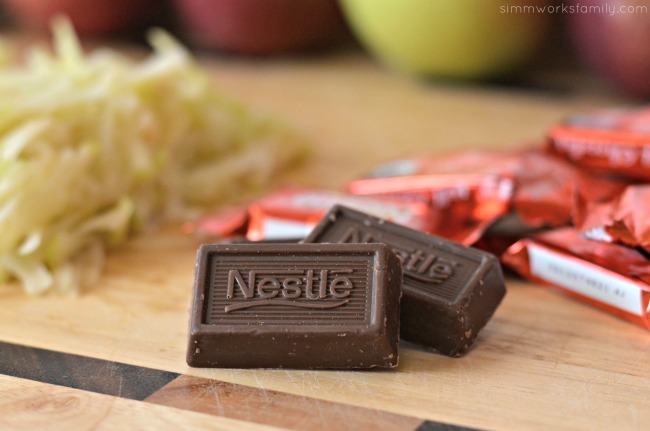 The combo of the apples and chocolate reminded me of our favorite candy apples. And the kids had a great time unwrapping the chocolate (one for you, one for me…). 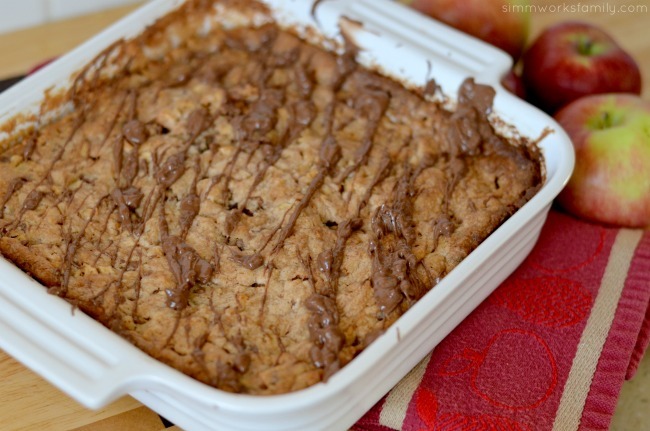 Add apples and chocolate to a 9×9 pan. Sprinkle with pumpkin pie spice. 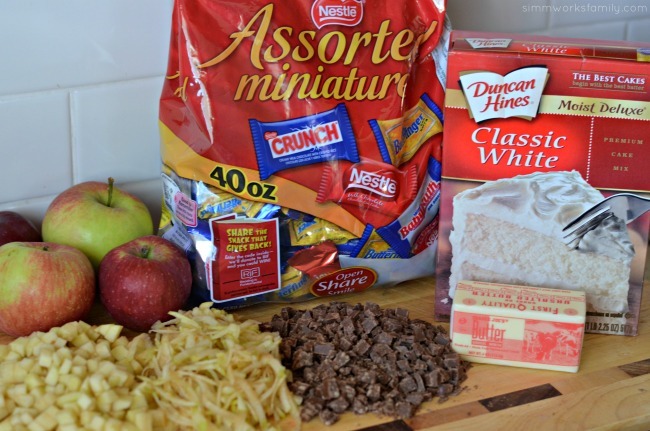 Pour cake mix over apples. Drizzle melted butter over mixture. Stir ingredients in the pan and smooth top. Bake in the oven for 35-40 minutes or until top is golden brown and toothpick comes out clean. Let cool 5-10 minutes before serving. Add a big scoop of vanilla ice cream and a drizzle of melted Nestle Crunch bar for an added bonus! How easy is that? Perfect for last-minute desserts that bake while you’re eating dinner or for potlucks with friends and family. And you can make this with just about any fruit! So depending on the season, pick out your favorite fruit and enjoy. Love what you read? Check out these great posts! As I’ve mentioned before, my good friend Nadia will be leaving soon and off to her next adventure as her husband gets new orders. So I’ve been wracking my brain with what I could give her that was easy to pack and would remind her of our friendship. 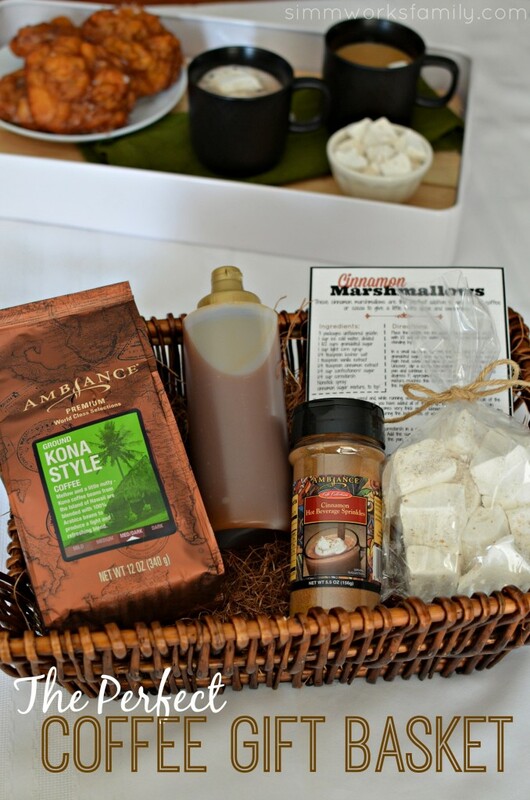 Since most of our time together is spent watching the kids and drinking coffee I thought that a coffee gift basket with her favorite treats would be the perfect gift! And adding a homemade element (with a recipe card, of course) just added that perfect personal touch. February is the month of love. And this month I plan on making sure my husband knows exactly how much I appreciate him. 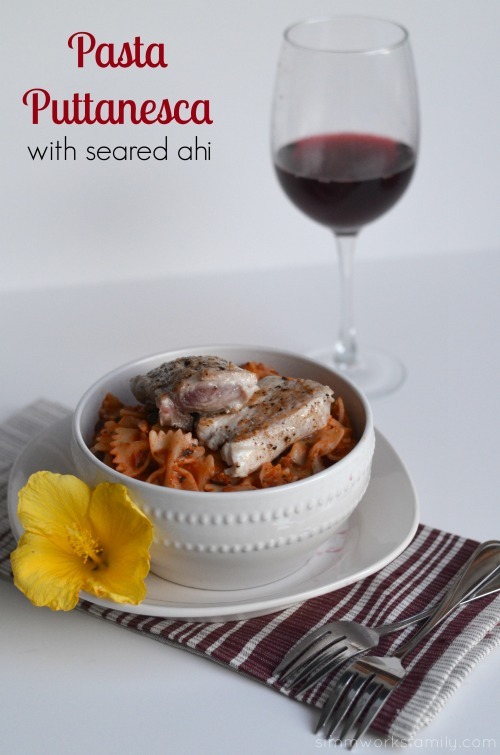 While we don’t have a lot of time to go out together one-on-one anymore, I can create a great evening just for the two of us with a special recipe inspired by our favorite places to travel: Hawaii and Italy. We’ve both loved Hawaii since we were dating and took a trip there with my family. Then we went again for our Honeymoon. And again with our two kids two years ago. The culture, the ambiance, the relaxation. It all screams the perfect vacation to us. I am a member of the Collective Bias™ Social Fabric® Community. This shop has been compensated as part of a social shopper insights study for Collective Bias™ and Smart & Final. Mother’s Day is all about mom’s favorite things, right? And I know that my mom – and mother in law – loves sweets. Since it’s been so warm lately I knew she’d appreciate something cool if she were down here (don’t worry mom, we can make these again!). So when I headed out to Smart & Final to pick up some ingredients for an awesome dessert to serve on Mother’s Day, I knew that First Street ice cream would be the perfect base for any dish. I thought bringing my husband along with me as we shopped would be a bad idea but he inspired this dish when he asked if he could pick up some chocolate chip cookies too. Genius!! 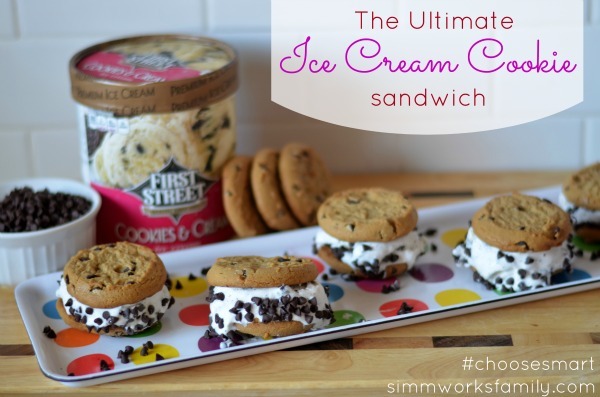 Why not make ice cream sandwiches? There’s one meal that I wish I could cook better. And that’s baby back ribs with bbq sauce. I absolutely love ribs. Love the taste, the mess, and the pile of bones left over at the end. I know, I know… I’m weird. But a good plate of ribs just hits the spot. And they’re the perfect dish to make for tailgating! So when I was planning my menu for my tailgating party I knew we had to serve ribs. Not only can they be made at home, but they can also be made on the grill and in the crock pot. So many different ways to make one delicious dish! 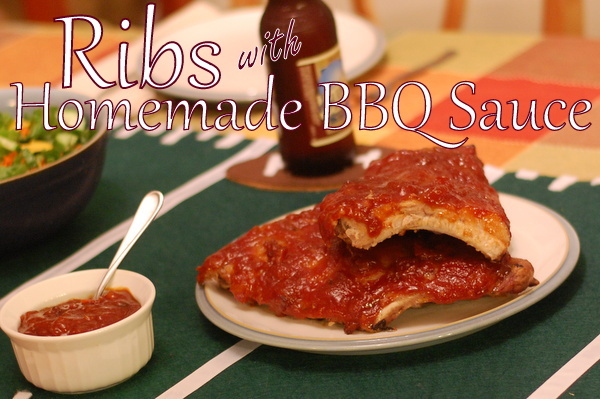 These ribs are even tastier because of the homemade barbecue sauce I made to go with them. And I have two surprises… my secret ingredient! Total Iron Chef moment here. We headed out to Smart & Final for our ingredients and I knew I wanted to pick up some flavored preserves. As soon as I saw the First Street apricot pineapple preserves I knew I needed them for my sauce. And it was the best choice I made! While you can use peach, apricot, or even raspberry preserves in this recipe, the combination of the apricot and pineapple gave this sauce an amazing flavor. You can check out my whole shopping experience by checking out my Smart & Final Tailgating Google + Album. One thing that has become very apparent these past two weeks is that it is, in fact, football season again. My tv is once again taken over and Sunday afternoons and Monday nights are filled with the sound of yelling and cheering. I have to be honest though, I’m not really that into football. But I am into football food! The excuse to invite people over to sit around and eat appetizers and yummy bbq is just too enticing. 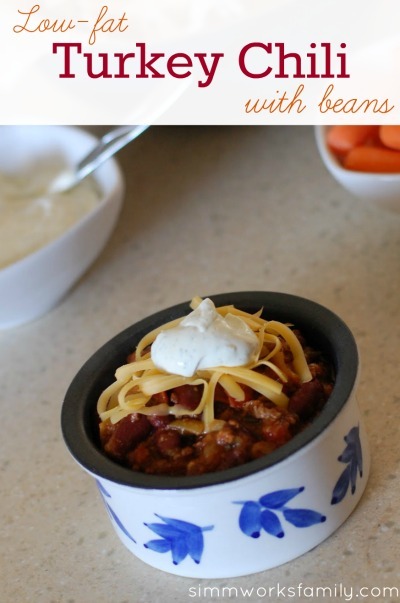 And one of my favorite go to recipes to make is a delicious turkey chili with beans.